Running point for Georgia Trade School, President and Owner Joanna Vinson is responsible for daily operations including student recruiting and enrollment, personnel, student affairs, office administration, finance and accounting, and employment partnerships. The best part of her day is connecting with students and seeing them thrive and grow! Joanna appreciates and relies on the outstanding staff of Georgia Trade School to make the award-winning welding school a remarkable place to attend and work every day. 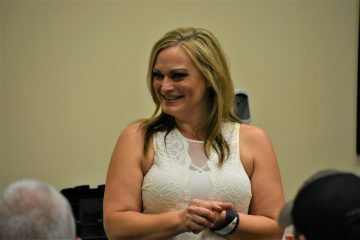 A native of Milledgeville, Ms. Vinson received a Bachelor’s Degree in Education at the University of Georgia, a Master’s Degree in Education from Georgia State University and an MBA from Kennesaw State University. Joanna is also a board member of the A.S. Mitchell Foundation in Mobile, Alabama. Joanna’s educational career involved lesson planning and implementation, student achievement, classroom management, and meeting learning and curriculum objectives. Her corporate career involved meeting and exceeding sales goals, managing client relationships, leading sales teams, branch and office management, recruiting, and P&L responsibilities. Her sales teams routinely exceeded sales goals and objectives and she regularly participated in leadership training and development programs. Joanna’s advice to aspiring welders is to take opportunities to travel or relocate as there is much to see, do and learn.